Dorothy (Dot) Lucille Kriegel Hohensee of Wall, TX bid her earthly home farewell 3 months short of her 91st birthday. She passed away Thursday, April 4, 2019 at Regency Senior Care Facility. Dot was born July 16, 1928 in the Miles, TX area to Alfons & Theresa (Weiss) Kriegel. Dot began school at the Concho Schoolhouse east of Miles. She later transferred to Miles ISD where she met Clifton Bernard Hohensee. They began dating in high school and never looked back. In 1944, Cliff left for Central Europe where he served in World War II. Dot waited patiently back home for his safe return. 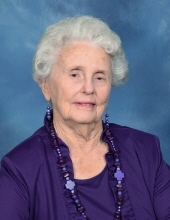 Dot graduated from MHS in 1946, then attended San Angelo Business College. In 1947, Dot married her high school sweetheart, Cliff. They moved to Wall where they were involved in farming and ranching. Dot was Cliff’s biggest supporter when he began his lifelong career in the cotton ginning industry. This meant many nights of providing supper at the gin office to Cliff and his counterparts. When Dot wasn’t at the gin or chasing sheep around the pasture for Cliff, she provided child care for several Wall natives in her home. Cliff & Dot raised their family in the Wall community as members of St. Ambrose Catholic Church where she was a charter member of the Catholic Daughters. Friends have credited Dot with being influential in the founding of the Catholic Daughters Court #1642. She served as Grand Regent, District Deputy & Convention Delegate during her time in this organization. She enjoyed being active in the St. Helen’s Altar Society. Being a proud 65 year member of the Texas Extension Education Association (TEEA), always meant good times with good friends for Dot. In 1990, she was named the Tom Green County Extension Homemaker Woman Of The Year. This kind hearted lady leaves behind a legacy of love for her children, grandchildren, great grandchildren & extended family. Cliff and Dot’s children are Alan Hohensee (wife – Patricia) of Miles, Mark Hohensee (wife – Debbie) of San Marcos, & Jan Yanez (husband – Jack) of Robert Lee. His 7 grandchildren are Angie Carver (husband – David) of Abernathy, Dusty Hohensee (wife – Heather) of Miles, Doug Hohensee (wife – Mindy) of Mereta, Joey Wilke of New Braunfels, Emilee Schwartz (husband – Cole) of Garden City, Sterling Hohensee of San Marcos and Blaine Yanez of Miles. She is called G-Dot & Grandma Dot by her 9 great grandkids – Caden, Berkley & Kelton Carver; Paige & Kate Hohensee; Jaxon, Hayze & Creed Hohensee; and Griffyn Schwartz. Dot is survived by her sister, Ruth Hyde and sister-in-law, Catherine Hohensee both of Miles. Dot was a favorite aunt, cousin and friend to many who loved her sweet smile and warm cup of coffee. Dot & Cliff spent many hours on vacation, at deer leases or ginners conventions with friends they valued as close as family. A rosary will be held Sunday, April 7th at St. Ambrose at 7:00pm. Mass of Christian Burial will be celebrated at 10:00 am Monday, April 8th at St. Ambrose. Burial will follow in the St. Ambrose Cemetery in Wall, TX under the direction of Harper Funeral Home. The family thanks Kindred Hospice and Regency Senior Care for their compassionate care of Dot. Memorials may be made to Kindred Hospice Foundation; 112 W. Concho Avenue; San Angelo, TX 76901 or St Ambrose Cemetery Fund; PO Box 228, Wall, TX 76957. "Email Address" would like to share the life celebration of Dorothy "Dot" Lucille Kriegel Hohensee. Click on the "link" to go to share a favorite memory or leave a condolence message for the family.